While tending to her ailing mother, Ruth discovers the pages LuLing wrote in Chinese, the story of her tumultuous and star-crossed life, and is transported to a backwoods village known as Immortal Heart. There she learns of secrets passed along by a mute nursemaid, Precious Auntie; of a cave where dragon bones are mined, some of which may prove to be the teeth of Peking Man; of the crumbling ravine known as the End of the World, where Precious Auntie's scattered bones lie, and of the curse that LuLing believes she released through betrayal. Like layers of sediment being removed, each page reveals secrets of a larger mystery: What became of Peking Man? What was the name of the Bonesetter's Daughter? And who was Precious Auntie, whose suicide changed the path of LuLing's life? Within LuLing's calligraphed pages awaits the truth about a mother's heart, what she cannot tell her daughter yet hopes she will never forget. 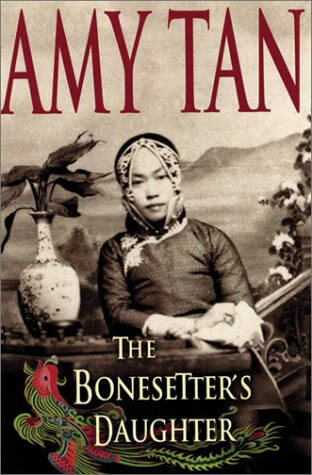 Set in contemporary San Francisco and in a Chinese village where Peking Man is being unearthed, The Bonesetter's Daughter is an excavation of the human spirit: the past, its deepest wounds, its most profound hopes. The story conjures the pain of broken dreams, the power of myths, and the strength of love that enables us to recover in memory what we have lost in grief. Over the course of one fog-shrouded year, between one season of falling stars and the next, mother and daughter find what they share in their bones through heredity, history, and inexpressible qualities of love.